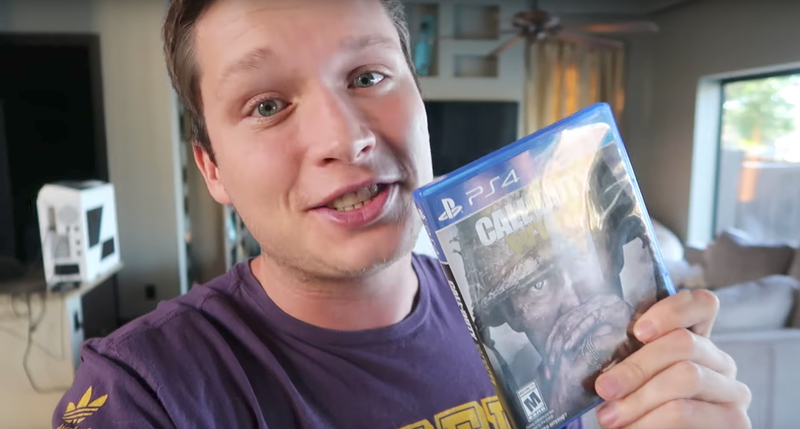 Trevor “TMartn” Martin, best known for violating FTC regulations by aggressively promoting a Counter-Strike skin gambling site that he didn’t say he owned, has returned to the spotlight alongside today’s release of Call of Duty: WWII—helping publisher Activision market the new game and raise money for veterans. The Race to Prestige is a long-standing around-the-clock fundraiser that raises thousands of dollars to help connect veterans to jobs and coincides with each year’s Call of Duty release, advertising the new upcoming game with celebrity players while earning money for a great cause. One of the Race’s founding members is Trevor Martin. Martin’s career as a Call of Duty YouTuber and streamer was tainted after a 2016 scandal around a Counter-Strike: Global Offensive skin gambling site. Along with his friend Tom “ProSyndicate” Cassell, Martin founded and promoted the site CSGOLotto.com, where users could gamble real money in hopes of striking Counter-Strike weapon skin gold. The rarest of those weapons could be exchanged for a lot of cash (the industry itself was valued in 2015 as high as $2.3 billion). Where Martin ran afoul of the FTC is that he promoted the site to his viewers, without making the key point that he was its co-owner. “We found this new site called CSGO Lotto,” Martin would say, posting videos like “HOW TO WIN $13,000” that, a class-action lawsuit later alleged, inspired kids to use the underground gambling site. Their neglect to disclose this serious conflict of interest ran against some Federal Trade Commission regulations. The crazy thing that happened next is that Martin and Cassell got off without even slaps on the wrist. A Washington court dismissed the class-action lawsuit brought against the YouTuber partners, and in September, the FTC determined that Martin and Cassell had indeed broken the law, but did not require them to pay a fine or even admit wrongdoing. Since yesterday, Martin has been on Twitch livestreaming himself playing Call of Duty: WWII for several consecutive hours alongside other big CoD personalities, all as part of the Activision-hosted Race to Prestige. And although it seems as if Activision will continue working with him, the first-person shooter community seems less willing to forgive him. Twitch chat has been full of pithy one-liners referring to the CSGO Lotto scandal. Many were quickly deleted by chat moderators, but several more slipped through. Reached for comment regarding this issue, Activision said via email that Martin is a “founding member” of the Race to Prestige who has “helped to support the Endowment’s cause,” but did not comment specifically on the CSGO Lotto decision. He still boasts 2.5 million YouTube subscribers.